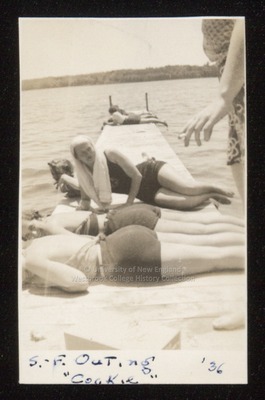 Westbrook Junior College students sunbathe on a dock in this sepia toned candid snapshot labeled "S. - F. Outing '36. 'Cookie'." On the back of the photo is written in blue ink: Cook. Cookie is the only sunbather propped up on her elbow so that her face is visible. She wears a one-piece bathing suit and has a towel draped around her neck. Other sunbathers, wearing bathing suit bottoms and halter tops, lie face down on the dock. A single student, face not visible, with a cigarette held in her left hand, stands close to the camera.